September 27, 2013 May 2, 2015 by Beau H.
Editor’s note: For an updated, four-part fall 2014 edition featuring a higher budget & more apparel categories, click here. The world of men’s fashion and style can be a bit deceiving some times. Top-tier looks pop up in the pages of GQ and Esquire on the regular, yet those looks aren’t exactly attainable for common folk in either price or, sometimes, in styling. So, what’s someone on a budget to do? There are plenty of easy, relatively quick ways to build outfits from the ground up under a decent price point. Keep in mind that these are only suggestions to be followed — there are cheaper combinations out there, for sure, because (about) $250 is still a nice chunk of change. There are more expensive combinations, too. But if you had to start from square one and completely re-do your closet, some of these suggestions should point you in the right direction. More importantly, the great thing about shopping on a budget is versatility; some wacky-print pants might stand out on the runway, but they’re not exactly cost-effective when it comes to heading to class or shopping for groceries. Buying items that work interchangeably and in several situations is a great first step to developing more personal style. That’s where sticking to Style Essentials can help you out, too. Clarks Desert Boots (Available on Amazon for about $100, dependent on size and style). 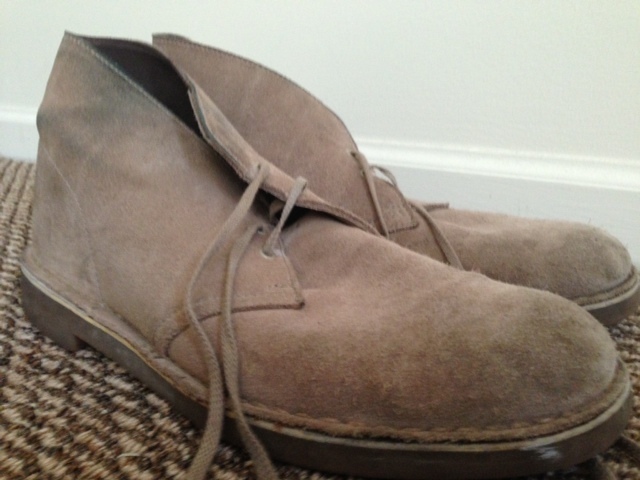 Personal pair of old, reliable tan suede desert boots by Clarks. Beat-up, but durable. As far as a casual shoe goes, desert boots are about as versatile as it gets for pairing with chinos and jeans, enough even to justify the high price point relative to the overall budget. In a neutral shade, like grey or tan, they can be worn with virtually any color of jeans or chinos while standing the test of time. They aren’t exactly fashion-forward by any stretch of the imagination. They look cleaner and more polished than a pair of sneakers, and for a pair of shoes you can wear virtually every day, the price point isn’t too bad, either. Swapping out athletic kicks for desert boots also forces you to step up other areas of your game, as well (try wearing desert boots with athletic shorts, for example). If budget expansion becomes a possibility, kicking around multiple different shades can leave you covered for virtually any situation. Check out retailers like JC Penney for boots at even lower prices than Amazon, too. If desert boots aren’t your thing, a pair of Canvas Authentic Low Pro sneakers from Vans could do the trick (Available for about $45). Some are partial to Converse or other classic sneakers, (Effortless Gent has a great guide on other types casual footwear here), but Vans are about as simple as it gets in terms of the logo and profile. These are a shoe that could switch between shorts, chinos and jeans interchangeably — not too bad for about $45. Keeping that white sole clean is key, and choosing a neutral shade amps up their versatility too. Dark denim (something like Levi’s 511 or 513 jean–now available for about $43 on sale). Dark denim on display. Jeans on left by Scotch & Soda. Right – Standard Cloth. Every guy needs a pair of dark blue denim in his closet. Some are extremely partial to high-quality, Japanese selvedge denim, made through a long process that definitely results in an extremely durable pair of jeans. For the rest of us, turning to an old standby brand like Levi’s will do the trick just fine. Know that places like Urban Outfitters also carry jeans like Standard Cloth in nice, slim fits. Sticking with the original though, Levi’s are the gold standard for classic denim. Look for a slim fit to keep those lines clean and avoid bunching fabric at your ankles. And keep the wash clean and dark (free of pre-distressing or holes) to stand out from the pre-distressed crowd in a good way. Snagging a pair on sale in person (at Macy’s or Urban Outfitters’ website, for example) could knock the price down even further. At such a favorable price point, they could turn into a “wear almost everyday” pair of pants, in casual and more polished situations, like with a white OCBD. 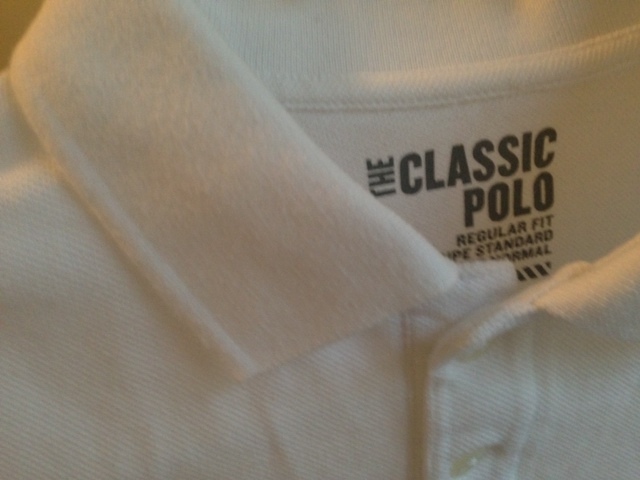 The ‘Classic Polo’ in white from Old Navy. About as inexpensive & simple as it gets. For those of us partial to throwing on a shirt with a collar in warm weather, there’s almost no better option on a college (or similarly cheap) budget than Old Navy. As of now, prices on some of the slim fit versions are down to $10. Just $10. A great deal, to be sure, and available in loads of colors. The key is to know that you get what you pay for. On a personal note, Old Navy polos have held up very well in terms of wash, fit and color, although some have had varying experiences. At that price though, it’s hard not to like what you see. Uniqlo also offers tremendously well-priced options. Reaching for a slim fit polo (or sizing down in a classic fit) ensures that the fabric stays trim through the body and around the arms — this is a big key no matter how big or small you might be. Old Navy and Uniqlo also offer t-shirts and pocket tees in varying colors to mix up your casual wardrobe options, too. 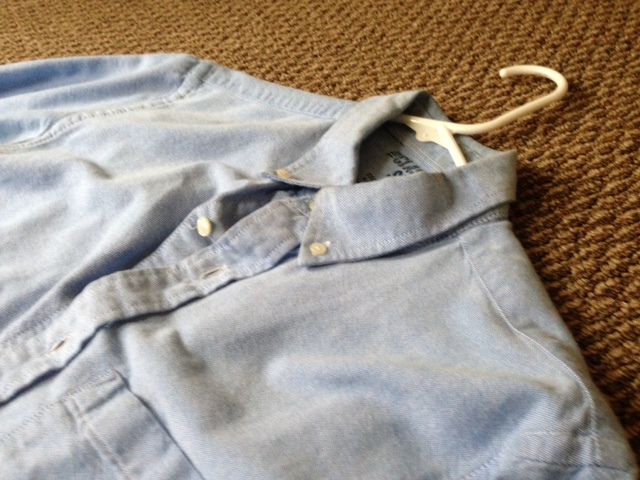 A classic blue OCBD from Old Navy. If I had to pick one outfit combination to wear into the cooler months of fall and winter, it would be some variation of the above style: A button-down collar shirt with a v-neck sweater, over dark jeans, with desert boots. It’s entirely appropriate for business casual settings in some areas, and it’s polished enough to go on a date or out to drinks without looking too formal, or conversely, too sloppy. Other options in the same price range include Target’s Merona line, which offers a nicely-done white OCBD (among other colors) for about $3 less than Old Navy. Using these two pieces interchangeably allows for terrific versatility; stock up enough nice sweaters and a few white or blue OCBD’s, and you can stockpile outfits for days on end while maintaining a consistent overall appearance. 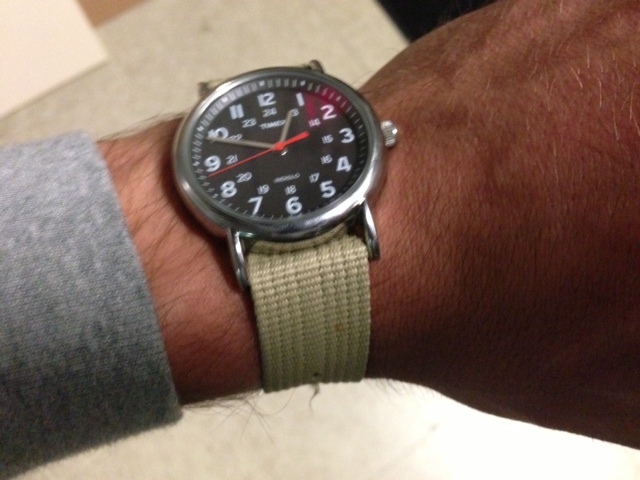 Watch: Timex Weekender or other options (Available at Target for about $35). The original. One of the best casual options on the market for someone on a budget. When we talk about a tight budget for a watch, paired with other casual clothing options, it’s tough to beat a Timex Weekender. It’s clean and simple in terms of design, and it can be customized with a wide variety of slip-thru straps. And like most of the other items on the list, the low price point could mean it’s not too terrible if it gets beat up a bit. Different dial colors (like grey or white) also lend themselves to other color combinations of straps and outfits. For those who prefer sportier looks, the Timex Expedition series might not be a bad bet. On the other hand, if you’re not a “watch guy”, per se, this is an area that could be skipped for now – leaving you with more money in hand. Patterned socks from Old Navy. While it’s extremely important to take stock of the major components of an outfit, the difference is in the details when wearing lots of simple, relatively classic pieces. 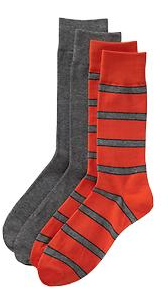 A standout pair of socks, when seen, add a fun pop to any outfit. Granted, some of those patterns from Old Navy don’t have the reaction factor that a pair from Happy Socks might, but they’re a good starting point. Given the fact that one pair of shoes made up the lion’s share of the total, to be able to snag other major pieces (and a watch) for about the rest of the price is a great way to tackle financial difficulties associated with shopping. It’ ll be necessary to deal hunt and do research regardless, but buying for color and fit is just as important as buying for price. Using these items as a guide could be a helpful first step to building a wardrobe on a budget. Sacrificing quality for price is a tough decision to make for most, but working through reliable, trusted brands like Old Navy and Timex can reduce the uncertainty around buying on a budget. Searching for versatility and fun colors also enhances the potential reach of each item, while saving you money for longer-term purchases. Now, start saving and get shopping while you can. September 21, 2013 by Beau H.
As the weather turns at least a bit colder and the calendar moves closer to October, it’s worth keeping in mind how you might phase out more warm-weather pieces for seasonally appropriate gear. Dark denim is an absolute essential in any season, but for the college-aged guy or younger, there are some nice alternatives worth exploring. Corduroy is absolutely one of those alternatives. It’s been popping up everywhere as of late on items as varied as blazers, but it arguably works best as a replacement for those jeans or colorful summer shorts. 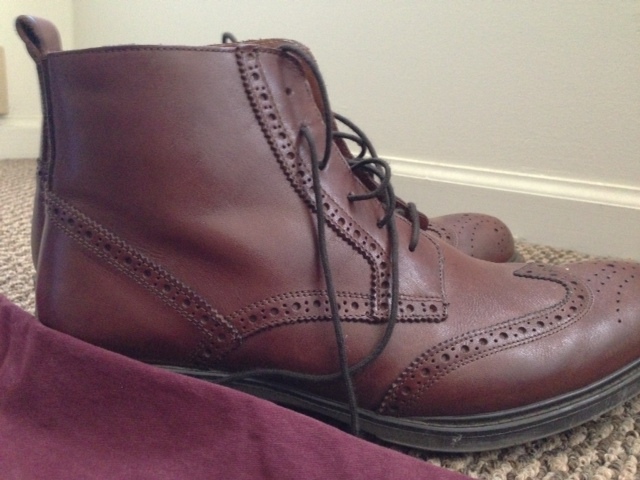 It’s a great textural change-up with a pair of wingtip boots, for example. And in the right shade, it can pair with plenty of different v-neck sweaters, cardigans and t-shirts alike. Working in some combination of those items — involving, say, an OCBD — is absolutely the ticket to getting a consistent style rotation and personal uniform. They’re also an excellent way to work in some fall color — perhaps a deeper, faded wash would work well here. A deep, dark brown shade in corduroy is the perfect fall alternative to denim. On a personal note, a newly-arrived pair of Old Navy corduroys fit decently trim through the thigh and leg, with a nice, not-too-thick weave at a great price (about $35 on sale). The color selection on Old Navy’s website also was extensive at the time of purchase, and it’s possible a few more pairs could be picked up at a low price point. Brown wingtip boots — the perfect pairing with corduroy. Places like Jomers sell a finer pinwale corduroy at a great price — that could work in a pinch, but thicker weaves are available at J. Crew and other outlets. Ideally, the fit of those corduroys should fall between a Levi’s 514 and a 513 — slimmer than a baggy pair of jeans, but not skin-tight. Looking for a minimal amount of break is also key here. The perfect pair could be cuffed or rolled and sit atop a pair of shoes without showing too much ankle. If that’s the case, some crazy socks could act as a conversation starter. While it’s not freezing cold outside yet, it’s never to early to start thinking a season ahead in terms of weather and style. Corduroys are a great piece to take you from dark denim and colorful shorts to the crisp days of fall and winter. They add textual interest to an outfit and function in the same way as denim. Experiment with deeper, richer fall colors and you’ve got another style staple in your rotation. September 13, 2013 by Beau H.
New York Fashion Week: The “Death” of Menswear? This year’s New York Fashion Week was somewhat of a watershed moment for the entire industry. More men are interested in dressing well than ever before, and there are more accessible and affordable ways to do it. But some designers might be getting lost in the shuffle, creating a pretty confusing situation for the average stylish male. A tremendous commentary by The New York Times targets this maddening trend pretty directly. On one hand, the line between what’s available on the runways and what’s available at common market stores seems to be shifting in perplexing ways. As the Times article notes, some designs seen on the runways could be had at budget locations for cheap, cheap prices. And others were rather horrifying like, (as the Times notes), what appeared to be some sort of a zip-up dress on a model in the Hood By Air collection. Of course, there’s always a degree of wearability (or “un-wearability”) to fashion. Some designs are innovative and fresh (or shocking and hideous) and others, as the Times notes, aren’t fresh enough. So are American designers running out of ideas, abandoning wearability, or too focused on brand building? And why have some brands, like Tommy Hilfiger, only focused on women’s wear at New York Fashion Week as of late? All things worth considering. With so many men seemingly interested in fashion and style, what are the key takeaways from looking at runway products? Sometimes, a flashy addition to an outfit is better. Other times, tried and true Style Essentials do the job just fine. Color and pattern are your friends. Mixing high and low looks (like dressing down that suit), could be worth trying in the right setting. And some trends, like camo, have true staying power. It’s never bad to come up with a personal uniform of sorts amidst all the confusion that Fashion Week can bring. Fundamentals and rules, too, make things easier for someone looking to improve their everyday style. Most importantly, with the industry moving at the speed of light, it’s worth noting that seasonally appropriate clothing that fits well and looks great never goes out of style. 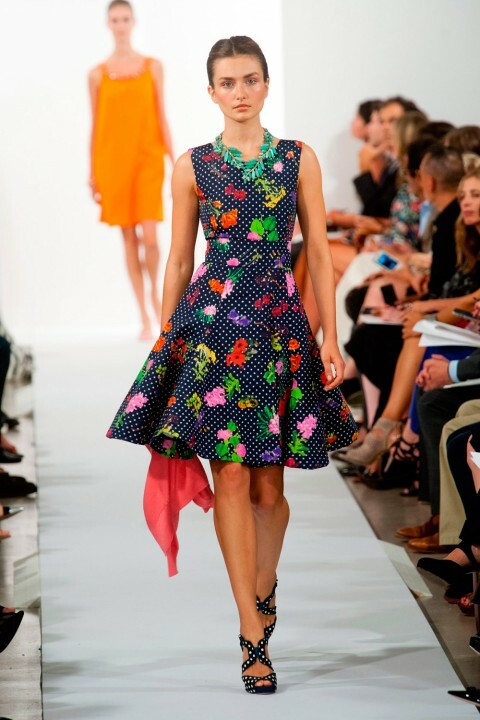 September 11, 2013 September 13, 2013 by Beau H.
Spring New York Fashion Week is always full of colorful florals and stunning finale gowns. This year, I was actually disappointed with a majority of the shows. Some shapes were too geometric and boxy for my taste. But there were still many shows and looks that stood out to me. These are some of my overall favorite looks from this week. Retro silhouettes were everywhere this season! What I really enjoyed about this look was the beautiful combination of blue floral and the black and white pattern it lays on top of. Tanya Taylor had her Fashion Week debut just a year ago, and opted for a runway show this season. The movement of the skirts were so graceful and visually appealing to me, which is exactly why she chose the runway to show off her collection. Though she is a young designer, I could see this collection appealing to women of all ages. Kate Spade is one of my all-time favorite brands and this presentation blew me away. The theme – a quaint European tour – was adorable and perfectly reflected. The first few looks, inspired by Paris, made me audibly gasp in public! There is just something about the dress and peplum top with the wrought iron gate pattern that stunned me. This collection had so many amazing silhouettes that were also very retro inspired. I loved the lemon theme representing Capri- it was fresh and perfect for spring. Finally, the quirky clutches, colorful shoes, and sleek makeup added the perfect finishing touches to each outfit! This show was hands-down my favorite show of Fashion Week. Again, the retro look was prevalent and that is probably why I was so drawn to this collection. I saw several long, romantic tutu-style skirts throughout runway shows this season, but this was my personal favorite. The fabric used in several of these designs was similar to Tanya Taylor’s small patterns under floral, and it worked beautifully in each look. The details in this collection really awed me and made it stand out to me. Chunky necklaces, earrings, and beautifully patterned shoes topped off each outfit. 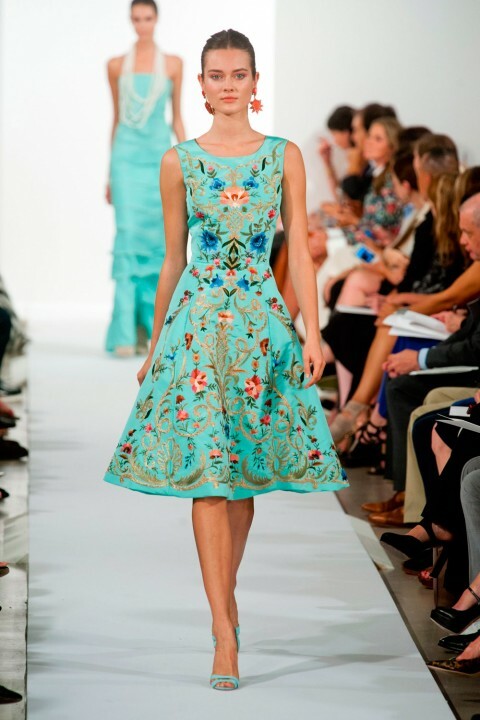 For some close ups of the details, check out the OscarPRGirl Pinterest board! Overall, retro looks and bold details dominated the runway. 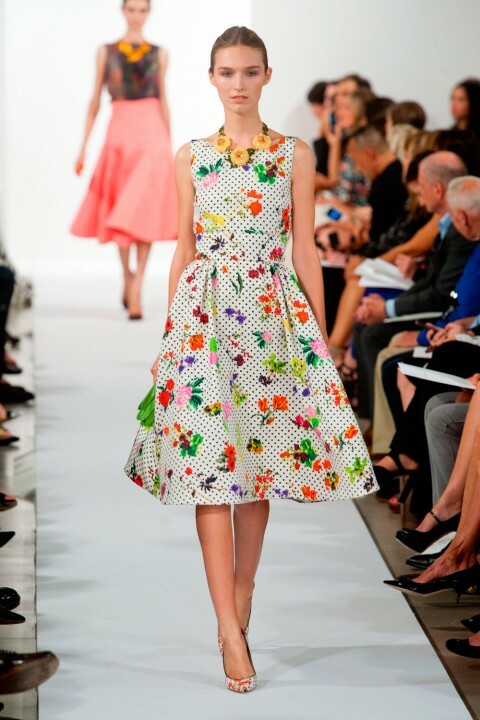 Though I was disappointed with a few shows, my high expectations for Kate Spade and Oscar De La Renta were fulfilled and even surpassed! To see more highlights of shows, check out the galleries on the Mercedes-Benz Fashion Week website. September 5, 2013 September 11, 2013 by Beau H.
UPDATE: Before you get into the main part of this post, know that the Stafford Camlin boots are going fast. Like, way fast. They might not be around many JCP stores for much longer, in fact, according to this post from Dappered.com. But the suggestion they offer there, while different in looks and quality, could work in much the same way as the Stafford Camlins. As temperatures dip and the sun fades across the horizon (a pretty bleak picture, no? ), most of us are heading toward fall and…brace yourself for it… winter. That means snow, cold temperatures and several quite noticeable wardrobe changes. If you’re fortunate enough to live in a place without significant temperature deviation, you might be in luck, and you can keep those summer shorts and polos in rotation for a decent amount of time yet. For those of us who live in other, less forgiving locales though, cold weather is in sight, perhaps even by the start of next month. Fear not, though. In terms of versatility and possibilities, fall is perhaps the best season for menswear. The potential for layering sweaters with button-downs (and pairing those combinations up with slim pants and a crisp pair of shoes) should be exciting for those of us who live in colder climes, even with the possibility of freezing temperatures. Namely, there’s one item that can take those of us in the cold through the fall and winter with relative ease and extreme versatility. They seem to be dwindling rather fast in stores as of now, but JCP’s Stafford Camlin wingtip boots could just be the snag of the season. Make no mistake, these are definitely a “wear anytime” boot, too, but it seems fall and winter is the particular sweet spot for boots. This particular pair was picked up on significant clearance about three weeks ago, in the last size available at the local JCP, so beware. 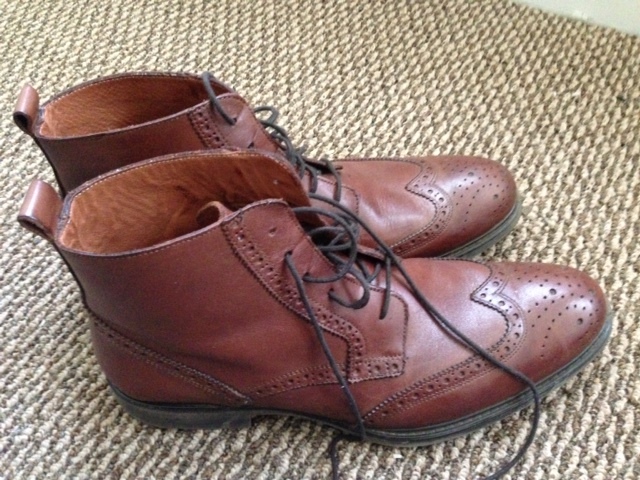 The JCP Stafford wingtip boots in the flesh. JCP underwent a pretty extensive revamp through Nick Wooster a while ago, and have since been shifting slightly back toward the old ways, but with the upcoming fall line and these boots, they have some winners hanging around. As to the boots, they’ve already received high praise across the board, and the looks really can’t be beat. And for that price, too, you can experiment with their coloration a bit, as well. For about $75 (or less depending on if you can snag a pair on the cheap before new stock comes in), you get a boot that works with jeans, chinos, cords, you name it. A boot with as solid a color of this also provides a nice bit of texture to an outfit, and something like this boot would go nicely with a blue-on-blue combination. 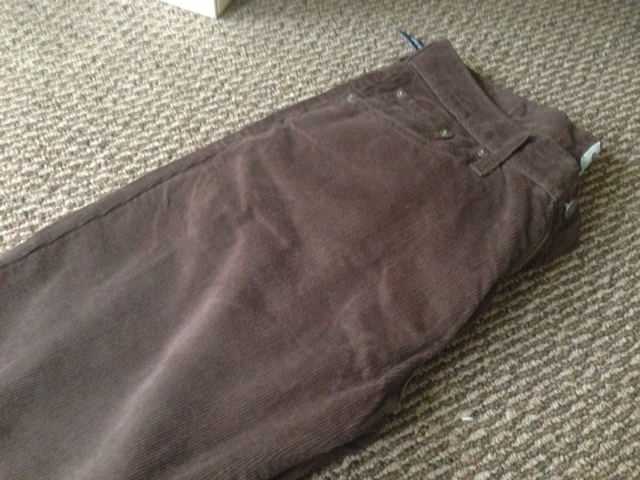 They’d work well with a darker-colored corduroy pant, as well. And even a crew-neck sweater and jeans tie in with these boots. 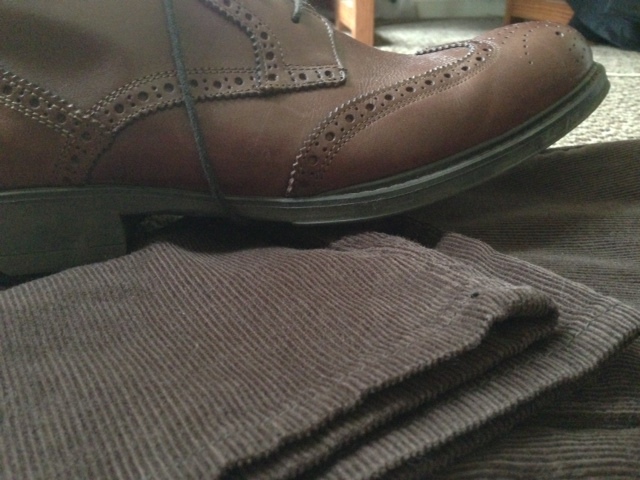 With fall, too, comes a richer palette of colors, like those burgundy pants as shown below. Pants by CPO Provisions, from Urban Outfitters. Furthermore, they’re the perfect answer to the business-casual shoe that’s just different enough. It’s a boot, so it’s not a full-on dress shoe, but it’ll still provide loads of nice looks in the office (or perhaps trekking across campus) as the weather gets cold. The boot style and perforations help set this shoe apart. This particular pair has already seen a bit of break-in duty prior to fall, but there’s no question that they’ll be a staple through the fall and well into the winter. 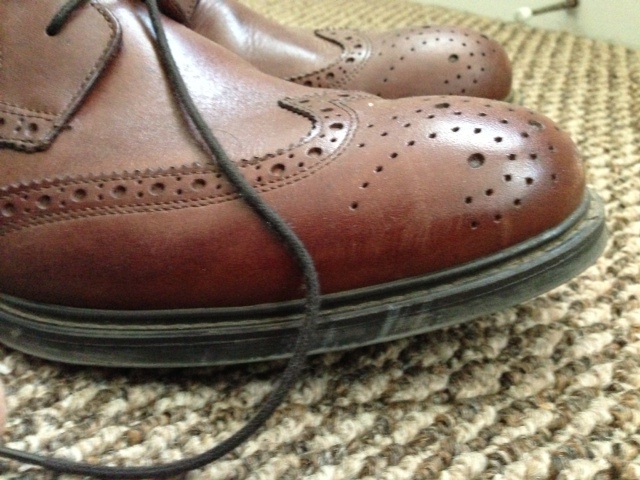 Since they’re not the priciest boots on the market, they can take a bit of a beating without too much worry, feasibly. And what’s more, they fit pretty comfortably. As Joe from Dappered notes in the above link, they do run quite large, so sizing down is critical. However, with that in mind, it makes perfect sense to hop on a pair of these boots while they’re still around. And when cold weather does hit, you can reach for these boots time and again without worry about price tag or scuffs. September 3, 2013 by Beau H.
Fall is quickly approaching and I have my eyes set on a trend that was all over the Fall 2013 runway during fashion week– Velvet. Velvet has been huge for the past few seasons and it will continue to live on this fall (According to Vogue and many other fashion sources). Sure, velvet might remind you of tacky ’80s fashion or Scarlett O’Hara’s iconic green velvet curtain dress, but its texture adds an interesting element to any outfit. The best part about this trend is that it is extremely affordable if you are on a budget and worried that the trend won’t last. Because velvet was huge in the ’80s and ’90s, it’s all over thrift shops and vintage stores! I found an awesome velvet blazer for less than $5 at Goodwill. An item like this can dress up any casual outfit and add an edgy element. For a more casual look, try velvet leggings or shorts. 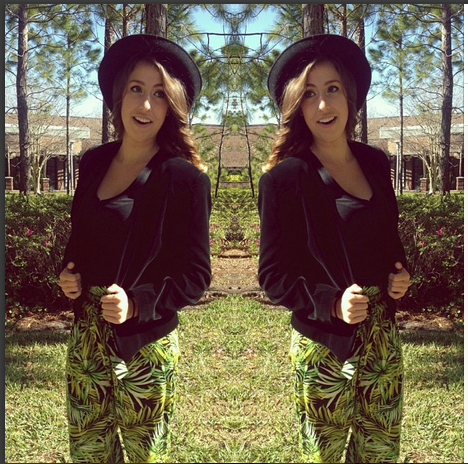 Velvet or crushed velvet leggings are great when paired with combat boots and a tank for a daytime look. If you live in a hotter climate, like myself, velvet shorts are an interesting way to incorporate this trend into your wardrobe without overheating. Check out Velvet and Leather by Jean J. on Lookbook.nu for a cool, casual outfit inspiration. If you are looking for a nighttime look, a velvet minidress is perfect for you. It’s a great combination of dressed up and playful. Pair it with some studded heels for a super edgy look! If you want to try this look but are a bit afraid of it, start with a velvet hair bow or velvet loafers. Once you feel comfortable rocking the accessories, move up to a bolder piece. A great location to purchase all of your velvet essentials brand new is American Apparel. Online and in-stores, they have so many colors and styles of velvet. This trend works in all climates depending on the pieces you choose to style and is very affordable. Although it has been around for several seasons, velvet is a trend that will continue to be very popular this fall.